From a [math]7/5[/math] inch long piece of ribbon, how many [math]3/5[/math] inch lengths can be cut? You are required to order 2 x 10 SPF framing lumber for the header of a window. The window requires a 2 ply header with a total length of 7' 9 1/2". What are the most efficient lengths of material to use? 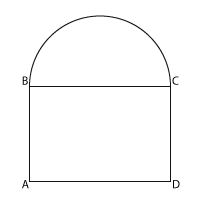 Given the area of the semicircle, which of the following can be calculated? What is the formula for finding MA? Which of these best describes the relationship between pendulum length and pendulum period? Length is independent of period. Lines that are congruent are . Which sentence uses the future tense? I measure the length of the fence. I measured the length of the fence. I will measure the length of the fence. "Light" can describe the of the number cube. I have measured the length of the fence. The total length of the edges of a cube is 12 times the length of an edge.